I stay pretty plugged in at work with music. I find it not only helps me tune out neighbors’ conversations and keep me focused, but also helps keep me motivated while keeping content. I also cannot stop from chair dancing. And who can possibly frown while chair dancing? And this is the song I cannot stop listening to (also featured in The Words trailer). Yesterday marked “Bring Your Child to Work Day.” For the first time, MW hosted programming for employees’ kids to come in and spend time with each of our departments while learning a little bit of the Werkers’ lifestyles. I got to spend some time with the kids when we had them create logos for themselves. And I finally figured out why Mom was also so persistent in bringing me. Because adults that bring kids get a much needed free-esque day in the office. I was super jealous the whole time. But it wasn’t because of my co-workers–it was their kids. Looking back, I saw those days as more of just a time I got to dress up and pretend to be something other than a kid. Little did I know how much those “copywriters” at Maritz would affect my life and career. So thanks Mom for always pushing me to go. For showing me that a cafeteria doesn’t necessarily mean an elementary cafeteria (though it often does). And thanks for showing me your secret hideaways at work. All of these moments instilled in me that you can have a messy desk full of toys and still be productive. You can walk away and shoot out zingers while still being highly respected by your co-workers. And that a day at the office where you weren’t ready to pull your hair out and wasn’t spent 50% of the time laughing, is not complete. Thanks for all that. But should I lose those lessons between now and next year, you might be the recorded employee with the eldest child at the annual day. It’s no secret that life in Chicago during the winter months is well, bleak. And even though this winter hasn’t been all that terrible, the fact that it’s winter and dark when you walk out of the office is depressing as hell. And that Lake Effect wind I just love in the spring, summer and fall is just brutal during this time of year. It’s why I always escape with a trip for a while. And why I’m ever so thankful Mom makes the voyage up here for a little trip. It feels like I’m getting away, without really going anywhere. This time, Grandpa Norm made the trip up with Mom. We had ourselves a fantastic time and shared many laughs during their 3-day visit. Grandpa got to see where I work (Mom: “It’s like the kids are running the zoo”), see where I live, hang out with Maggie (Maggie: “I asked if I could hug him”) and enjoy all this city has to offer under bleak skies. 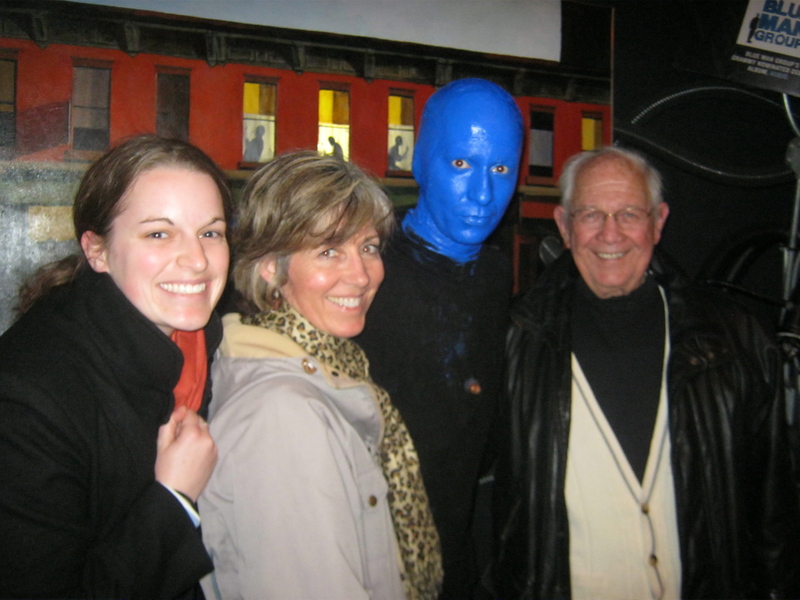 We celebrated the city’s 175th birthday, caught a Blue Man Group show and saw The Artist in the only way you should, in a theatre. At the end of the trip, Grandpa Norm turns to me and says, “I can see why you love it so much here.” Seal of approval that I’m doing a-okay in life. Stumbled upon this 5k race that sounds right up my alley. After completing my first last month for The Arthritis Foundation in their Mingle Jingle run, I didn’t think I wanted to do one again any time soon. I mean, I finished that 5k without much training, but thanks to the snow that was falling, the sidewalks we ran on turned into ice from all the packing the snow down. So while it was beautiful to run in some Chicago snow, it was pretty scary. Had a great group of gals who ran with me and friends came out to cheer me on. Plus, running for a cause that was dear to me was pretty important. My team and I raised $500 for The Foundation, so I was pretty happy. And wasn’t even thinking of my next 5k run. Then I came across this 5k, The Color Run. At every kilometer, you get “spritzed” with color powder. Each kilometer is a different color and at the end of the race, you’re just colored from head to toe and then participate in a color bomb/blast. I’ve been pitching the Holi Festival idea in a bunch of brainstorms, but no one’s taking the bait. It’s always been something I’ve wanted to be a part of. It just looks so spirited, so lively and well, so colorful. Gotten a bunch of gals from work and around the city to participate with me. Should be in pretty good shape for it since I’m working out and taking water aerobics with other arthritis gals (all over the age of 50). And hopefully, no snow will be around. Now it’s just time to think of a colorful name for the team. We got a snow day last year. And an early dismissal. Never thought those were even possible in the work world. But they are and today, we just got an early dismissal. Good thing Maggie’s making chili tonight and we’ll hole up in our apartment. Looking out the window right now and this is what I see. 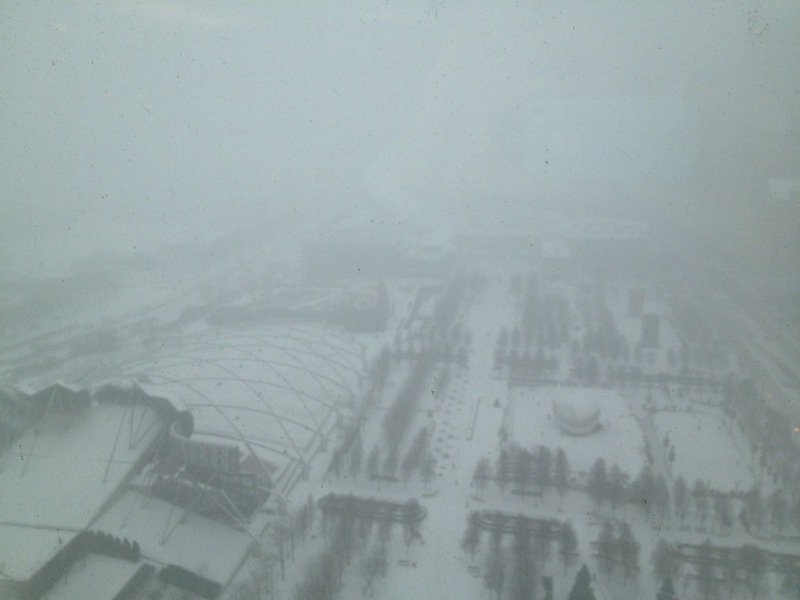 Where oh where did Millennium Park go? Last night, my friend Natalie and I went to the opening night celebration for the Field Museum‘s newest exhibit, (opening today) Whales: Giants of the Deep. We got dolled up and enjoyed fantastic foods and drinks the whole night while diving in with the whales. The exhibit was pretty cool and filled with skeletons of various whales making you feel so incredibly tiny. But my favorite, and most shocking moment, happened when we stumbled upon a replica of a whale’s heart. It’s basically the size of a Mini Cooper. No joke. And as we stood there, dressed to the nines, our mouths just hung wide open. But our favorite moment of the night came during dinner with a nice couple from Elmhurst, Cheryl and Johnny I believe? They were our parents’ ages and hilarious. We couldn’t have asked for better table company. They told us their story and we told them our transplant stories of arriving in Chicago. Then Cheryl said something that just made Natalie and I put down our forks and drinks (which, let’s be honest, is quite the feat). Cheryl delivered this line with such brutal honesty to us. It didn’t feel like advice, it felt more like a command. Now it’s no secret, Natalie and I play. And play hard. This week alone we’ve had events every night of the week. And yea, while we’re exhausted today and I’m 4 cups of coffee in on this Friday, I wouldn’t trade any of it. In a city that offers so much every day of the week at every hour of the day, it’s crazy to not take advantage of it. I have friends who work themselves ragged throughout the week, work on the weekends and have maybe 12 hours for themselves that spend sleeping until noon. And it makes me sad for them. Because Cheryl’s right; there’s always going to be more work.